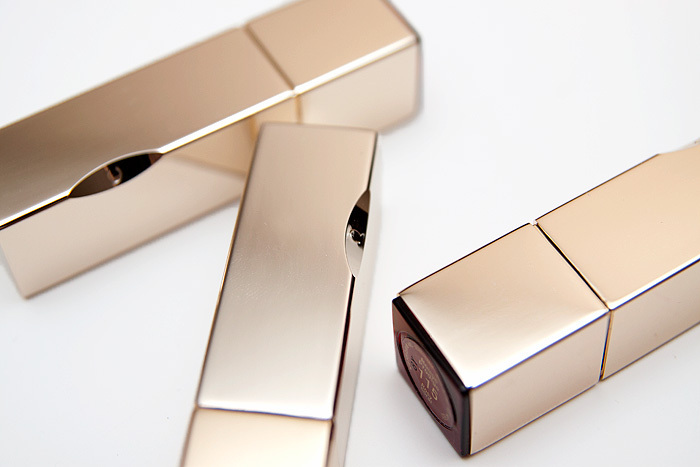 Summer 2011 was all about the glossy, sheer look for lips with shades like Chanel’s Boy making the biggest waves across the beauty blogosphere. Clarin’s Autumn lineup has included three new Rouge Prodige colours* that replicate the sheer, glossy trend but in a more Winter-appropriate formula that’s less balmy and longer-lasting than the Summer offerings. 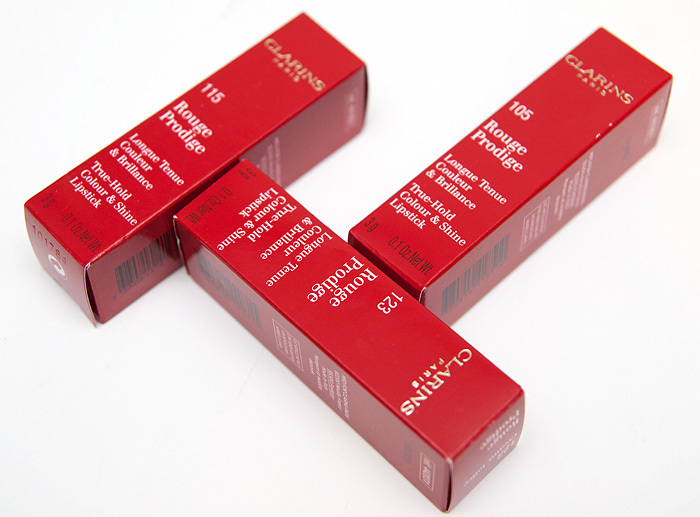 The Rouge Prodige formula continues to feel quite different to most other lipsticks. 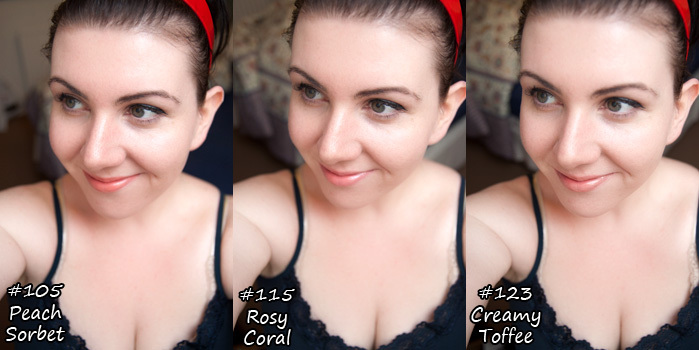 For a long-wearing texture, it feels moisturising on the lips and fairly tacky, though not in a gloopy, lipgloss way. These don’t dry my lips at all but you may find the stickiness a little awkward if you’re prefer a matte-r feeling. Here’s how they look applied and in context with the rest of the face. You can see here that each shade is fairly transparent with a hint of base colour. The most pigmented is #105 and I felt that each shade would particularly suit specific skintones: #105 for warmer skins, #115 for cooler skintones and #123 for darker complexions. The new shades add polish and shine to a made-up face without injecting too much colour. Balm fans will be delighted to find a longer-lasting alternative to the Summer trends, colour-freaks? Not so much. 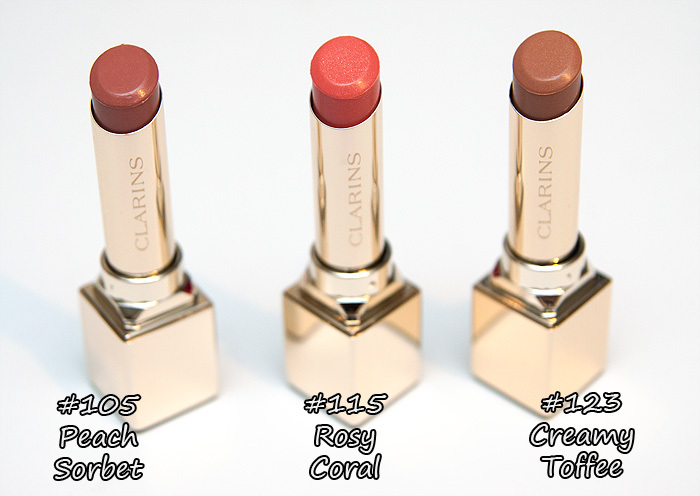 The new Clarins Rouge Prodige shades are available to buy now online at Clarins.com and on counter, priced at £17.00 each. I love them all! Must investigate at Duty Free! Love the packaging, but just not enough colour for my taste. I’ll pass and my purse will be pleased I did. Rosy Coral is very pretty! Love the packaging too. Rosy Coral Lipstick is one of my favorites. Does it stand for hours? I NEED THESE! I love coral and peachy lip shades. Whaaa!! Want! Want now! wow…gotta say I love those lip colors on you! On pale skin it looks so great, my medium skin won’t be able to cut it. Love your blog! 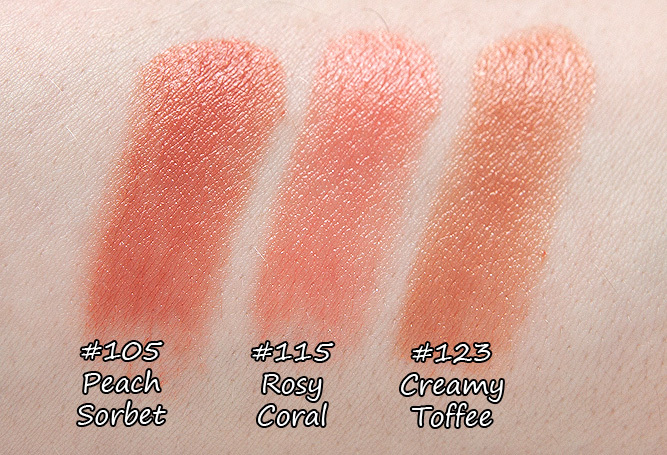 Just one question, in the “pot”, these lipsticks looks like they have some shimmer/sparkle, but looking at the swatches on your hand and lips it seems that it does’nt really show up. Do you see any shimmer in person?